Reviews | Red Sprinkles - 10 lb. Put the finishing touch on all of your desserts with a burst of fiery red color from these fun, decorative sprinkles! They'll add sugary sweetness and unique texture to any dish. The uses of sprinkles are endless, making them a versatile ingredient to have on hand. Sprinkle these tiny, thin, rod-shaped confections into your signature cookie batter, atop a flavorful ice cream sundae, or use them to garnish frosted cupcakes. Whichever way they're served, they're sure to be a staple for your ice cream parlor, bakery, or diner. And with 10 lb. of sprinkles, you'll be in good supply! This 10 pounds of red sprinkles are a great bulk buy for all your toppings needs in any dessert or home baking. Excellent bright red color that pops and taste ok.
Super vibrant red colored sprinkles! They make great toppings on top of cupcakes for holiday themed items like Christmas or Valentine's Day. The color looks just like the pictures shown. The red sprinkles are vibrant and priced unbelievably low. Cheapest I could find. We used for our Valentine D?pe Bites. Love getting individual colors in bulk so I can use alone or mix to make my own blends. Perfect size and color. Packaged well in a plastic bag. When I saw the box of sprinkles, I couldn't believe how big it was! The bag inside was easy to scoop and the color was exactly like the picture. Perfect for hot chocolate baubles. Love the vibrant red color and the size of the sprinkles. Use them on our cones and ice cream during the holidays. Our signature color is red, and these sprinkles represents well. Not dull and small like some of the other brands. Only down-side is not being available in a 5 pound bag. It's hard to find red sprinkles when you need them. We use this item on the cake we make for our homeless friends and they love it. The red sprinkles are well packaged and priced unbelievably low. The sprinkles are a fund way to decorate cookies around Valentine's Day. They taste really good too. We use these for a wide variety of things, from decorating brownies to topping specialty or seasonal drinks. Around valentine's day they added a little bit of romance to anything that needs a little something extra! An amazing red sprinkle in bulk at a great price. The best color to use around certain holidays and makes a great eye catching topper to our cupid bagels. Try personalizing sprinkles at your business with a local school or town colors. We mixed these with white sprinkles to make Miami University colored ice cream topping. Go Redhawks! I have these at my ice cream shops that I operate in GA and PA and also at home. They are really good and you get a lot for what you pay for. We love changing out our sprinkles to fit the current holiday. These red sprinkles not only taste great but are perfect for Valentine's Day, Christmas, and the 4th of July. 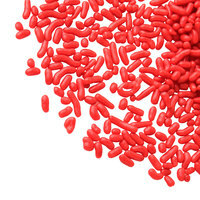 A wonderful quality red sprinkles that are great for decorating heart shaped cakes and cookies. The sprinkles tastes great and have a really nice texture. When we placed our order on these back in November, we thought that they would be there forever, but we were wrong. They went really quickly, thanks! The red sprinkles are a great buy and perfect for our bakery during the month of February. A great bright red color perfect for decoration our sugar cookies. Great soft true red sprinkle. This is the best price on bulk sprinkles I have found. Excellent deal for something that is used everyday. Color does fade if left in sun for extended periods. Wonderfully packaged box of red sprinkles that shipped super quick. The box was lined with plastic and helped keep the sprinkles fresh. They are a great red color and perfect for Valentine's Day cookies. Decent overall price on these as compared to having to purchase at a retail facility. Quality as you'd expect. Will purchase these again in the future. We love these sprinkles. The vibrant red color is a huge hit with young and older customers alike. We will definitely be purchasing these sprinkles again. Nice bright red color and you can't beat the price for the amount of sprinkles you get! Will definitely purchase again in the future! Thanks! So vibrant and bright. Goes great with green sprinkles for the holiday season. Love the bulk option of sprinkles as well and the taste is just how it's supposed to be. Used for our red velvet cupcake decorating needs. These red sprinkles really stand out when used with white cream cheese frosting, vibrant colored sprinkles for sure. Red is such a fun color. It's no surprise why it's a popular color for many holidays. These are great to dress up treats for all of them. There's also great for everyday use. I bought the sprinkles to use in my frozen yogurt shop. I like being able to purchase single colors so that I can match specific holidays and themes. We are using the red mixed with green for Christmas and red mixed with white to match college football colors. Our customers love them and they are a great value! Love my bright red, delicious tasting sprinkles! I use them to complete the Valentine's Day treats as well as Christmas! Any time I want to brighten a basket, red sprinkles come into the mix! We switched suppliers for all our sprinkle needs to webresturantstore.com! They have the best selection of colors and the best prices. We've purchased all the colors and mix them ourselves to achieve custom blends for special events. The red, white and green are holiday staples however, alone they can be used or blended with other colors for other holidays (red and white for valentines. Orange, white and green for St. Pats.) The combinations are endless! Great product! These sprinkles were the added touch that I was looking for. Sprinkles are shipped in a big plastic bag. Shipping was great and easy. These red sprinkles consistent color throughout each sprinkle. They have a mildly sweet taste that is not too overbearing. It does not interfere with the taste of the item it is being sprinkled on. Here in the heart of Razorback country, our customers LOVE our Hog sprinkles. We keep them stocked in both stores and they fly out of there on game weekends! Great color, good taste, color doesn't fade or run on whipped or butter cream icing. We use these on cupcakes every day. Good price, will reorder. The color of these are great, and a pretty good price. We use these on our chocolates, cakes and cupcakes all the time. Use all the time. A great confetti sprinkle for many applications, it's sweet but doesn't taste like food coloring, which is big for buying sprinkles in bulk, You will not find a better price, I've looked everywhere and these are the best. I love these red sprinkles!!! Taste great, good value and perfect bright color for so many holidays through out the year! Great as an ice cream topping or accent to any baked good! We use red, yellow and blue sprinkles from WebstaurantStore for our assorted cookies. They are bright and easy to handle, and the price is great. These sprinkles are great for Valentines Day treats for loved ones or for orders at the bakery. I love using these for many things around the shop/. These red sprinkles are great. They are a vibrant red color and have a great sugary taste. Great for topping cookies, cakes and cupcakes alike. We use these sprinkles at the bakery all the time. They have a good taste to them and are a wonderful vibrant red. They look great when put on any pastel colored frosting.